Visual Studio Code>Other>Docker ComposeNew to Visual Studio Code? Get it now. Manage Compose projects (Up, Down). 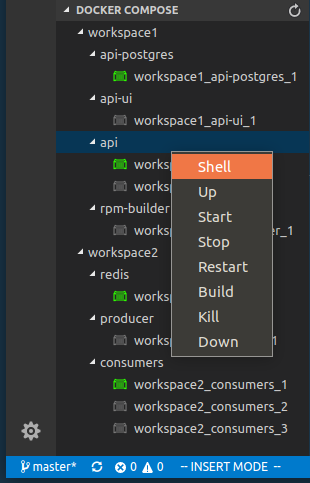 Manage Compose services (Up, Shell, Attach, Start, Stop, Restart, Build, Kill, Down). Manage Compose services's containers (Attach, Start, Kill). docker-compose.projectNames: Override Docker Compose project name for each workspace root (Default is basename of the workspace directory). docker-compose.files: Docker Compose files. You can define array of files. (Default is ["docker-compose.yml"]). docker-compose.shell: Specify shell to use inside Docker Container. (Default is "/bin/sh"). The extension is in early stage. Feel free to report bugs.